- Fashion Ecstasy on 一月 15, 2018. 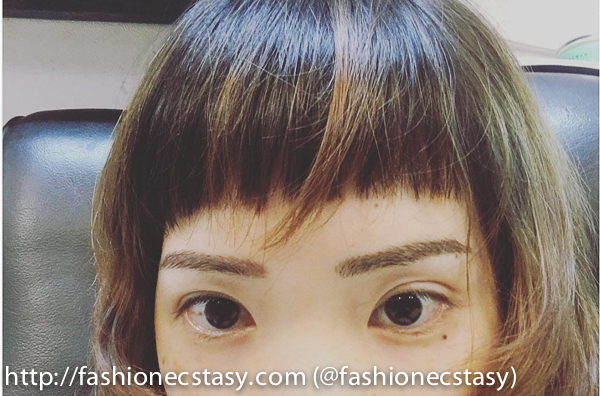 I’ve finally completed my third eyebrows microblading session at Twiggy Lash Studio in Taipei, Taiwan! I’m pretty satisfied with the results of my second session already as it didn’t fade as much as the first session, but I want more. Greed tells me more is better, maybe I am under culture influences. I ask Victor, my microblading artist for a bolder look but he kindly reminds me that it may look unnatural. After feeling ashamed for almost getting Kardashian- influenced, I come back to my senses. After two visits, I trust Victor’s professionalism entirely and leave the decision up to him, and I’m not dissatisfied with the results at all. Healing/scabbing: The healing for my second time micro blading session was not too different from the first time, scabbing was minimal, and only one piece of scab formed the day before my third session. The results, however, were much more defined than the first. Itching: the itching after my second microblade session was much less than the first. I remember freaking out a little bit the day after the first time because I wasn’t confident if I could refrain myself from scratching. Itchiness the second time was less and manageable. My brows turned red the very same night after my first session, but it never went crazy like those seen on YouTube, if anything they just looked like I picked the wrong colour for my brow pencil. There was no redness stage after my second session.